Our top 10 moments continue! Remember, this list includes the moments that stood out to me and is a matter of opinion from my seat. I am willing to bet your list may be totally different from mine, or you might agree. Regardless, hopefully it will jog your memory, and, most of all, get you ready for the great 2018 season. One of my favorite movie scenes is from Ferris Bueller’s Day Off. Ferris, his lady Sloan and his mate Cameron all go to Wrigley Field. The Braves and Cubs are playing, and they catch a foul ball— of course. But what I love is Ferris and Cameron shouting the old standby chants: “Hey, batter batter, swing, batter,” along with “he can’t hit, he can’t hit….” It is baseball gold and might have been a pretty appropriate soundtrack to play at T-Bones games in 2017. The year of the “Whiff”. Early on last season it was pretty clear that the 2017 T-Bones pitching staff would throw misses to a good number of bats. By June 6th the team had set a new league mark for strike outs in a single game when Kansas City struck out 24 Wichita Wingnuts in a single game. That game did go 14 innings, but it was the most strike outs by a staff in a regular season game in league history—despite the extra baseball. We should have known then that something was special with the 2017 pitching staff. 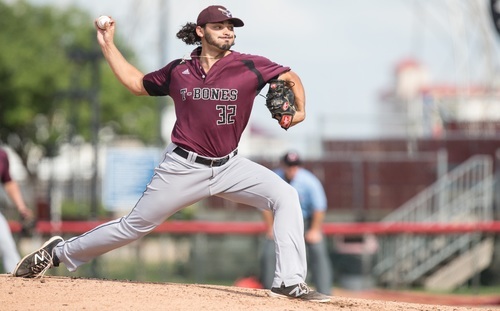 On June 17th, a day after Chris Perry struck out 10 batters in a game, the T-Bones led the AA in strike outs with 261 through 25 games. The pace was one of historic nature, but how could they keep that pace up? The club record was 682 in 2012, and math told us the record would not stand if Kansas City kept the pace. The pitching staff also regularly used the strike out as a weapon. The ability to strike anyone out at any point garnered confidence among the staff and fear among those who faced them. The odd thing about the strike out total was that it took the team until June 6th to hit the 10 strike out mark when Perry hit it for the first time since Jared Messer did in August of the previous season. The team would see a starting pitcher notch at least 10 K’s six other times. On July 21st the team was averaging 9.3 per game, and on August 13th the number still hung at 9.2 per game. It was clear by mid July that the franchise mark was in jeopardy of being broken and that the league record was not far behind. Barring anything unforeseen, we were all on a serious record watch. I must have added our totals and countdowns nightly from the 15th of July onward. Early on I would note it every few games, but by the end of July it was an obsession. The routine was to take the number of strike outs we had as a club, divide by the total number of games we had played, then multiply the result by what we had left. This would give me our target date. It fluctuated a little, but the first week of August was the target for the club mark and a little later for the league mark. Joe Calfapietra has forgotten more baseball than this voice will ever know, but I did wonder a few times early on, why play the defense in a spot with runners on (or something to that effect)? Well, he knew that a runner at third and one out had about a 50-50 shot at best to score, as few teams would put the ball in play against our pitching staff. It had become a weapon. It also meant that there were 9 fewer balls being put into play a game. That was nine fewer chances to commit an error or get a crazy bounce or whatever else could happen. And some nights, it was even more. July rolled into August with Matt Sergey, Scott Carroll, Chris Perry and Gabe Perez doing their thing, and the pen of Cody Winiarski, Grant Sides and the resugent Luis Paula were on lock down mode. Winiarski finished the year with eight straight saves in eight straight opportunities with 11 K’s in eight innings. He had an August with 16 strike outs in his last 12 innings overall. Sides had 30 strike outs in his last 23.1 innings. Perez would finish 4th on the team’s single season strike out list with 114. That pretty much sums up what this club was doing by then just to get to those marks. The T-Bones made their second trip to Fargo’s Newman Outdoor Stadium on August 7th - 9th. In the final game of the series, Grant Sides struck out Chris Grayson in the 8th inning to tie the single-season franchise mark for strike outs at 682, a record set in 2012. An inning later, Josh Mazzolla lead off the inning, and then Cody Winiarski retired two more batters via the “whiff” to break the franchise mark. Now all that was left was the league mark.